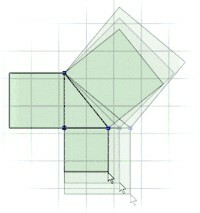 Shapes are the basic building blocks in Crocodile Mathematics. You can use them to build a wide range of models. The Parts Pane is where you choose the shapes you want to add to your models. The shapes pane can also be used to include equations, numbers and graphs in your model. The shapes range from lines, circles and arcs, through triangles and squares, to regular and irregular polygons where you choose how many sides you want. Dragging corners or lines will alter the properties, but it will stay the same shape; for example, no matter how you alter it, an isosceles triangle will always have two equal angles, and a square will always have 4 equal sides. A "general" tab allows you to change the colour and transparency, dimensions, position, rotation and scale of your shape. You can make your shape spin about its centre, while the "connections button" lets you link it to other shapes. Crocodile Mathematics allows you to link shapes' properties to one another by defining a relation between them. The simplest relation is riveting together two points. To do this, drag the points until they are coincident. Then click on the points once and they will be joined together. 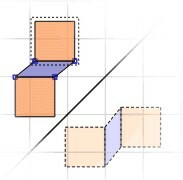 When you move or resize with shapes that have connections, the shapes that they are connected to will also be affected. 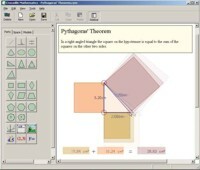 Simple connections can be used to create models demonstratng many laws and theories, such as Pythagoras' Theorem and trigonometry. Preset enlargements are 2x and 0.5x, but you can also choose to type in whatever value you want. The standard axes are y, x, y=x or y=-x, but you can also choose any gradient or intercept you want. Again, there are predefined rotations of 90 and 45 degrees, but you can type in any values for the angle and centre of rotation. Type in x and y values for a translation. You can also define transformations freely using the matrix tool. This allows you to specify your transforms exactly. It also allows you to use shapes to provide a visual illustration of matrix arithmetic. You can also click on the transformed shapes, to work with them or to apply further transformations. You can also drag centre of a rotation or the axis of a reflection on-screen, allowing you to visually define the exact transform (or combination of transforms) you want. Crocodile Mathematics has a graph tool, which allows you to quickly draw graphs on-screen, and edit their parameters easily. The graphing functions in Crocodile Mathematics let you use plot functions just as you would with a graphic calculator, but with an easy-to-use interface and a flexible, clear display. You can plot a wide range of functions, from lines and parabolae to exponential, trigonometric and hyperbolic curves. It also lets you choose the scales and sizes of the axes - you can choose specific ones for specific functions, such as trigonometric axes. Once you’ve chosen the nature of your function, use control points on the axes to change constants such as gradients and intercepts. The control points let you sweep through a range of values for constants, seeing how they affect the curve’s shape. Connections between the parts in your model can be made by clicking and dragging with the mouse. They are used to link the parts and build mathematical models. To create more complex relationships, you can include an equation. This allows you to specify how the properties are related. Once relations have been set up, you can choose which parameters they link. To do this, click on the relation arrow and choose the parameter you want from the menu which appears. The number part is linked to the equation in the same way, and can be used either as an input or an output. Using equations in this way allows you to use the shapes on-screen to provide visual demonstrations for abstract concepts. For example, you could investigate inverse proportionality by linking two shapes with an equation so that, as one is enlarged, the other shrinks. 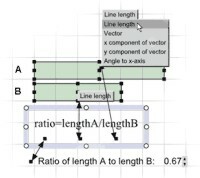 Number parts link to equations and shapes to provide inputs and outputs for your models. Numbers can be used in two ways. The example shown here has number parts which are linked to specific parameters of shapes. As the shapes are moved or resized, the number parts follow these properties, allowing you to monitor the effect of your actions. 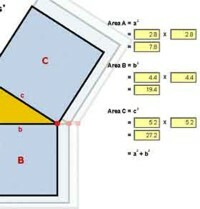 This also allows you to use shapes to illustrate abstract numeric and algebraic concepts as well as geometric concepts. For example, you can represent the effects of interest on money in a bank account by linking equations, shapes and numbers together. Alternatively, number parts can be edited on-screen. This allows them to be used to input numeric values for the shape parameters to which they are linked. For example, you can use them to bring a number line to life, with shapes showing the relative positions of decimals or fractions.